Artisan Crafted Leather Accent Sterling Silver Band Ring, "Leather Minimalist"
Dark brown leather complements the elegant attributes of sterling silver in a ring from Peru. Designed by Leslie Granthon, the attractive band is expertly crafted by hand. 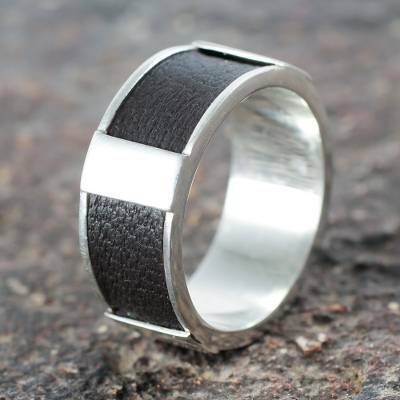 You can find sterling silver band ring 'Leather Minimalist' by Leslie Granthon in jewelry categories such as No Stone Rings, Silver Rings, Sterling Silver Rings, Leather Rings and Band Rings. Enjoy exploring these sections for other Novica treasures. Leslie Granthon has received 5 microcredit loans with 0% interest from Kiva and Novica, the first for $500 and the most recent for $700. Proceeds were used to purchase silver, her main material, to increase production, in time for the holiday season. My husband lost his wedding ring on a water slide... yip he did! This ring was his Father's Day present and it is absolutely gorgeous, beautifully made, and the right blend of strong and soft elements that one would look for in a ring for a dad. Love it! and he loves it too! The Hold My Hand ring created by Ms. Granthon is one of quiet design but yet makes such a big statement. I wear the ring on my small finger and it fits so well, the ring is truely one of a kind. This is the third ring created by Ms. Granthon that I have purchased, the other two So Inclined (blue stone) and Hug (green stone) are also quality pieces of jewelry, her craftsmanship is the best. I received the Hug chrysocolia stone ring today and it is absolutely gorgeous. This is the second ring I have received that Ms. Granthon designed and her style is modern but yet sophisticated. I also have So Inclined and both rings are truely one of a kind creations. Recently I also ordered Take My Hand and am anxiously waiting for it to arrive. The ring was beautiful and arrived in a lovely bag. Wonderful work!